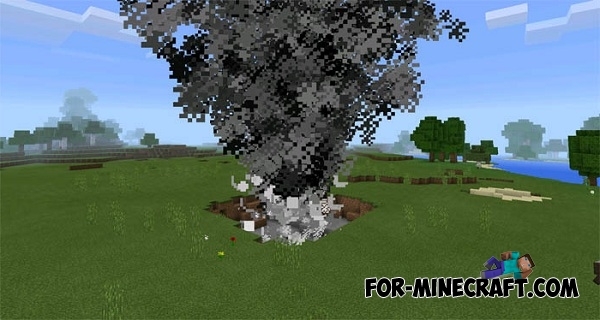 Tornado mod adds a new deadly weather phenomenon in MCPE. By installing it, you will be in mortal danger. Now you have to build a real bunker because the tornado destroys everything. Of course, a tornado is not generated independently, you need to spawn it with a special item (id - 1001) or use a text command (/girigirieye). Take spawner and tap by it on the ground. Then run away, save your lives. You can also change the radius of a tornado (/edit_tornado). Furthermore, you will find information about a tornado in the center of the screen. Mortal Kombat X mod v2 for MCPE 0.14.0You want Mortal Kombat's mod for Minecraft PE 0.14.0? It has been created! i like it how did you creat it?